Ken Leistner with Lee Moran after his 1,003 lb. Squat. "I write off the top of my head (and somewhat out of my head upon occasion). I do not have a degree in journalism and never learned to make drafts, corrected copies, what have you. I sit, I type, I mail it to Mike (Lambert) who sleds through the gibberish and tries to correct my spelling errors, remove most of the profanity, and make my columns readable. I assure you that unedited excerpts, if incorporated into a book, would not become approved reading by most PTA's." Note: It is what it is, and honestly, I dig the hell out of it. Dave Draper, Mike Katz, Ken Leistner. Coming from a long line of welders and iron workers, I have a real love and appreciation for equipment, especially training equipment. I get a warm glow when I see a bench or racks that have been welded with patience and skill. Having done some work for Nautilus, I also appreciate the difficulties that come in designing equipment that meets physiological needs, and yet has been crafted with the artistic touch often reserved for valued antiques. For these and other reasons, I have always had training equipment at home. Because I receive so many questions regarding home vs. gym training, this may be a good time to talk about some of the pros and cons of both. When I returned to N.Y. from the darkness of Cincinnati, I needed a good place to train. Two possibilities presented themselves, well, two feasible ones. I could train at a local club which had good, basic equipment, or I could train in my mother's garage, which had no equipment, but which would force me to design and make my own. I took the obvious choice and set about copying some of the designs I had seen in the various magazines and gyms. I should add that I never really considered some of the 'bodybuilding emporiums.' New York has more places to train than any other place, except, perhaps, California, but back in the Sixties, my father would continuously warn me about all the 'hopheads, queers, junk dealers, and creeps' that hung out at the gyms. I often thought that he had the lifting gyms confused with boxing gyms but my old man was not one to be corrected, not by me anyway, and if he decided that I would be cut, stomped, shot up, raped, tattooed, and/or otherwise abused while pursuing strength and health, hell, Jack, I wasn't about to argue with him. This, of course, takes us to point number one: Is there a gym in the area that you will be comfortable lifting in? Of course, if you're way up in Montana somewhere, you may have to lift at home due to the lack of facilities, but most locales have one or two places that one can PL in. But, will you be comfortable? The only way to determine this is to hang out at the place a few times, check out the members, note the ambiance or lack of it. It will be tough gearing up for a 600 DL if you have 12 business types, white crew neck shirts, lifting 'pads' on their hands, barely sweating, wondering aloud, "Why is that man trying that hefty looking weight, Rodney?" and generally treating you like the king freak in the place. Obviously, you'll PL better in the company of others who PL. This cuts both ways though. Many, especially the younger lifter, or the fellow of moderate abilities, are uncomfortable in the presence of really accomplished athletes. Having two world champs benching next to you tends to be intimidating and if you're of that ilk, a very heavy duty gym may not be for you. A gym that caters primarily to bodybuilders may or may not be for you either. In St. Louis, most of our guys trained at Turner's North. Of the three Turner's gyms, this one was perhaps the only one that had any real PLers training there. 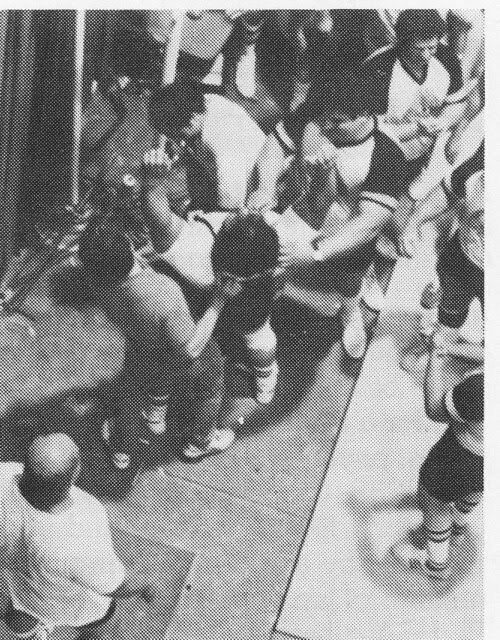 Most of the people on the floor were bodybuilders, and much of the equipment was specialized for their use, but Davis, Wickham, Rosciglione, Sumner, Glenn, and Sallade were given great support by the pumpers, and a lot of them used heavy weights in their own programs. This type of situation could be ideal. In a gym in which there are PLers only, the gym owner will invariably be strapped for finances as most clubs pay their bills via the bodybuilders, women, and business types, and the facilities may not be up to standard. Also, the bodybuilders are always trying new things, need a variety of equipment, and could, because of these two points, add lots of good input to the PLers program. Keep in mind that few of us are programed genetically to be world, national, or even state champions, and while a few sets on the Nautilus or Boyer Coe or some other exotic piece of equipment might prove detrimental to the champion, it might be just the thing for the average lifter (most of us) in terms of providing interest, novelty and more muscle work for the PL program. On the other hand, some don't do well in machineland, cutting back the hard work needed on the 3 lifts in favor of a few riot-bombing sessions on the delts, pecs, and abs. (anyone remember the article on 'riot bombing' featuring Zabo, circa 1967 or so?). It's often easy to become bewildered when faced with the prospect of gorging the lats on 47 completely different pieces of machinery. For any PLer who has potential physique potential, it's also easy to fall prey to the flattering comments of fellow pumpers who might entice you to 'can that heavy stuff man, it'll only kill your joints. You oughta lift with us and carve yourself a real physique, put some slots into that mass. Hey, you could do real good.' That type of encouragement is guaranteed to kill your total. and I would usually opt out for a quick nap before ascending the stairs into the loft to tackle the iron weights. Commercial gyms usually have a time schedule that must be adhered to and if you can't make it to the gym that particular day at a particular time, well, there goes another blown workout. For those on rotating shifts, this can be devastating; for if they can get to the gym, they're often out of sync and can't manage a good workout anyway. In this case, the home gym is again ideal. Just lift whenever time permits, before or after meals, naps, whatever. Time becomes a friend instead of an enemy as you can train as the mood allows or dictates. If one has a home gym, it has to be equipped. Fortunately, the PLer needs little: a bar, weight, a bench, squat racks. Anything else is bonus, and that might include a pulley setup, incline bench, some dumbbells. Rubber mats on the floor are a necessity, if only to protect the bar, a major investment. One can, of course, purchase the necessities, or build them. I would suggest going for iron vs wood. Believe me, wood racks will probably not be as safe, although I have seen some that will outlast anything else ever put together. Hunt through the various manufacturer's catalogues, check freight prices (often as much as the equipment), and go for the best deal. Always try to buy locally to save shipping and time, but beware of the 'sporting good shoppe' that jacks the prices up markedly. Invest wisely and don't be afraid to spend a few extra dollars for safety. Appearance is in the eye of the beholder, but don't skimp on quality construction for the sake of $20. Your hospital bills will outstrip that easily if a cheapo rack dumps 500 pounds across your leg. Buy from those who advertise in PL USA, they help give you this magazine each month and are reputable. If you build your own, poke around the local gyms so that your bench meets the proper specifications. Insure that the finished product will fit through your doorway, into the cellar, etc. Many a time I've had to dismantle a rack in disgust because I couldn't jam it through the doorway. One of the early Nautilus stories involves a delivery to a well known bodybuilding eccentric who found that the equipment would not fit into his garage, not through the existing doorway, anyway. 'No sweat, you guys can knock it down.' 'What, no way, you want that wall down, you knock it down, otherwise we'll just take the stuff back.' With that, our friend took a 40 or 50 pound dumbbell and wielded it like a hammer, and did it in such fashion that made us believe he'd done similar things previously. Within a few minutes, we were stepping over the cinder block rubble and carting his equipment into the now well ventilated building. An immediate reaction to the suggestion of outfitting a home gym could be trepidation at laying out a couple of hundred dollars. 'Hey, gym dues are only $150 a year.' True, but at the end of that year you've spent lots more for travel, parking (in the bigger cities), time lost, etc., and you'll have nothing to show for it in terms of material goods. A home gym is an investment that will not lose its value and which will last almost indefinitely. We still use the Olympic set that I bought when I first began training and I can guarantee that my son will be using it. The weights don't get any lighter nor do they depreciate in value. If anything, had I been sitting on 10,000 dollars 15 years ago, an investment in weights would have brought back two to three times that by now. Same for benches and racks. A major advantage to home equipment is that it can be very liquid. Whenever I've needed money (which has been often), I've sold off equipment, figuring I could replace it easily enough. If you're willing to wait it out a bit, there will always be someone who needs exactly what have and are seeking to unload. If you buy a bench and you want to either upgrade the quality, or get tired of it, sell it and again, you would be very surprised at how easy this is to do. However, the best advice is that once you have bought something, DON'T sell it. If you have little use for it at a particular point in time, if storage space and finances permit, save it. Guaranteed, somewhere down the line you'll want/need it again and it will cost a lot more to replace. I've done that trip often enough to tell you so. You will never know when you'll want to do leg curls again and because money is worth less daily, you're bound to go for more the second or third time around. On the other hand, the gym offers a commodity that may be tough to replace, and that's guys or girls to train with. Spotters are needed on the heavy sets, encouragement is appreciated at critical moments, and correction of technique flaws is difficult if you train alone. News of good lifts made by others may tend to excite your lifting and drive it to new heights. Of course, if your gym or Y is populated by some of the classic yo-yos that inhabit many weight emporiums, you might be best off playing tennis or staying home to train. There is nothing like setting yourself up for a max squat and having some dude yell across the gym, 'Hey Tony, you get laid last night!!!' Invariably, there are those who feel that the passing of gas during YOUR big lifts is about the funniest thing since Henny Youngman. Waiting for equipment can be tough too. There is nothing more frustrating than 'working in' with a group of guys who do one set of bench press to every nine sets of B.S. conversation. If the gym is short on Olympic/Power bars and/or plates, that just compounds the problem. The Olympic lifters probably have more trouble than we do most of the time, but let me tell you, it'll raise your hackles if all the bumper plates in the gym are being monopolized by pumpers doing curls with the EZ bar. Try telling them that the big rubber plates are for the two lifts and watch the blank stares you get. For the gym short on Olympic plates, it's a similar story . . . 'Yo, Roscoe, think I could have those fives for a bit?' 'No, man, I got to do my triceps, you know.' And yes, he'll explain that the move for tri-blitzing is a bit smoother with the big-holed plates ('Makes me feel very powerful, my man.'). The ideal situation, and I see it, is to have three good friends who are also maniac devotees of PL. This will give you the advantages of a home gym and the advantages of good partners. You'll be able to share and develop enthusiasm, push each other onward and upward, lift as your personal schedule permits, and have the safety of being spotted and corrected. It would be a good idea to check in every now and then at the local Y or gym to pick up new information. Attending a Pacifico seminar or those given by others will provide your training with a shot in the arm. A real heavy day at the gym will also get you jacked up if you're used to lifting at home. All those strange eyes on you, everyone just watching as you load the bar to bending limit is also a rush, especially when they don't know who the hell you are. I once clean and push pressed 275 five times at the Boston Y (weighing barely 150) back in 1975, only to put it to some loudmouth who was close to physically abusing some of the younger lifters. He insisted on 'instructing' them, yelled at them, told them they weren't worth a damn, and made the statement that if they lifted like him they could possibly make it. Of course, the younger guys didn't even know this turkey and wanted no part of him, but were somewhat afraid and so were willing to let him ruin their workout. I watched this for a while, and as soon as he began to tell me how I should be lifting, I loaded the bar and did my little trick. Man, the place got real quiet and this jerk asked, 'Duh, how long you been lifting?' 'I don't, I just screw around with it and have only been back at it for about three weeks.' With that I drifted out, immediately ran to the head to throw my guts up and laughed hysterically remembering the look on the guy's face. Imagine my delight when went upstairs to the track and saw this bozo jogging around, arrogant as hell, actually bumping little old ladies as he tooled around the oval. Well, I couldn't resist. I ran up next to him and asked why a fat, obviously unconditioned man such as himself was risking immediate coronary collapse in an attempt to burn all of that adipose tissue. He about busted a gut trying to run with me for about a half mile, and then I just pulled away, and let him stand next to the track while I put together three consecutive 6-minute miles (in those days, I usually ran a slow paced half mile, and then burned it for three to four miles, cooled off for 1/4 mule or so). From what I heard, he disappeared for about a month. If you have to deal with folks like these, hey training will be tough. Of course, there's the other side of that too. If you can go to a gym that is well run and occupied by serious lifters, it could be the thing to spur you on to new records. Black's, Pacifico's, Frantz's, the old Olympic Health Club are a few examples of commercial establishments that are the epitome of 'good' places to train. It will obviously take some looking around, but give some thought to this aspect of your training. Environment vs heredity is always good for nine hours of discussion, but give your genetics the best possible chance to blossom.